Fisher Gold Bug, Gold Bug Pro, and Gold Bug DP. What’s the difference? There is sometimes a bit of confusion about the difference between the new Fisher Gold Bug metal detector and the Fisher Gold Bug Pro . They look almost identical, but they are priced differently and indeed they are different detectors when you look into the details. First, let’s not confuse the current Gold Bug with the “Original” Gold Bug metal detectors that were designed be Fisher nearly 30 years ago. They decided to use the same name, but these are completely different detectors. Ok, now that we’ve cleared that up, let’s talk about the differences between these detectors and determine which one is best for your needs. The only visible difference between these two detectors (aside from the name) is an option to manually adjust the ground balance. These are the + and – buttons on each side of the Ground Grab button. On the Gold Bug, this only adjusts the discrimination levels, but on the Gold Bug Pro it has the added feature of manual ground balance. The only other feature differentiating the two detectors is Fisher’s claims that the Gold Bug Pro has higher sensitivity. Whether the sensitivity is better because the detector is actually different “under the hood,” or whether you simply get better sensitivity because you can manually ground balance the Gold Bug Pro to achieve optimal settings is not well-explained by Fisher. 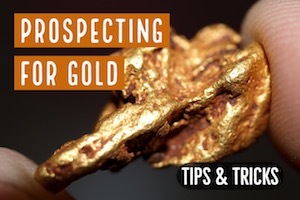 Now that both detectors have been on the market for many years now, it seems almost all gold prospectors have gravitated toward the Gold Bug Pro, spending the extra money to have the manual ground balance feature. What about the Gold Bug DP? 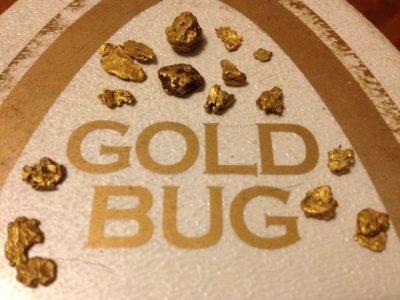 Here is a bit more confusion about the newer Gold Bugs to consider. There is also a Fisher Gold Bug DP, which is nothing more than a Fisher Gold Bug Pro that is sold from the factory with a larger 11” elliptical coil, rather than the smaller 5” round coil on the Gold Bug Pro. This is the first time that I can recall a metal detector being marketed under a completely different name just because it has a different coil. Put on the 5” coil and you’ve got a Gold Bug Pro, put on the “11 coil and it becomes the DP. The Gold Bug DP with the larger coil is still a good gold detector, but I think the larger coil is marketed more toward general coin and relic hunters than for the gold prospectors. 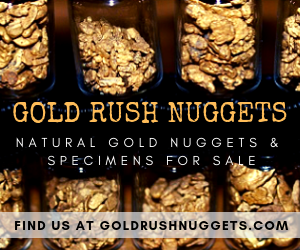 For gold nugget hunting, there are better coil options (read below). All of the various Gold Bugs are good gold detectors, but after many years of using one I thought I would share my favorite setup that seems to be the best specifically for finding gold nuggets. When I first started gold prospecting with the Gold Bug Pro I used it with the stock 5” coil, and this is a great setup right out of the box. The small coil is very hot on the tiniest little gold nuggets, making it a sweet detector for hunting shallow bedrock locations. There is an optional coil that I want to mention because it is now the only coil I use on my Gold Bug Pro. It is the 5″ x 10″ Elliptical DD coil that you can buy separately. I find that this coil has essentially the same sensitivity as the small 5” round coil, but you get twice the coverage with the larger coil. Plus, the “hot spot” on this coil is right at the tip, making it really amazing at hunting in tight spaces because you can poke the tip of the coil into cracks of bedrock and access areas that even that small 5” coil can’t get to. For general use metal detecting for coins, relics, and occasionally gold prospecting, the Gold Bug may be the best choice for your needs. 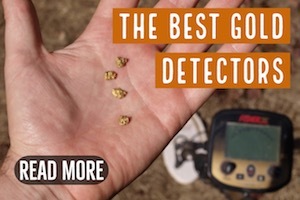 It is still a hot little detector, and since it is priced a few hundred dollars less than the Gold Bug Pro it is a great deal, perhaps one of the best detectors in its price range. 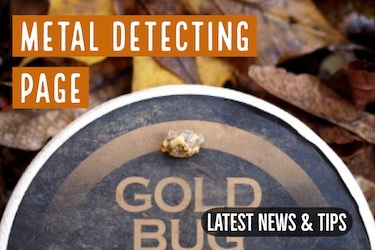 For a dedicated gold prospecting metal detector, I personally think it is worth the extra money to get the Gold Bug Pro for the manual ground balance feature. When using the Gold Bug Pro, from the coils available I personally prefer the 5”x 10” DD, 5” DD round, and finally the 11” (DP) in that order. To be honest, that 5” x 10” DD coil stays on permanently now. 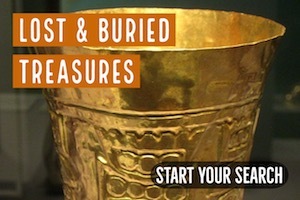 When properly set up, these are some of the best metal detectors on the market today, and some of the most user-friendly as well.